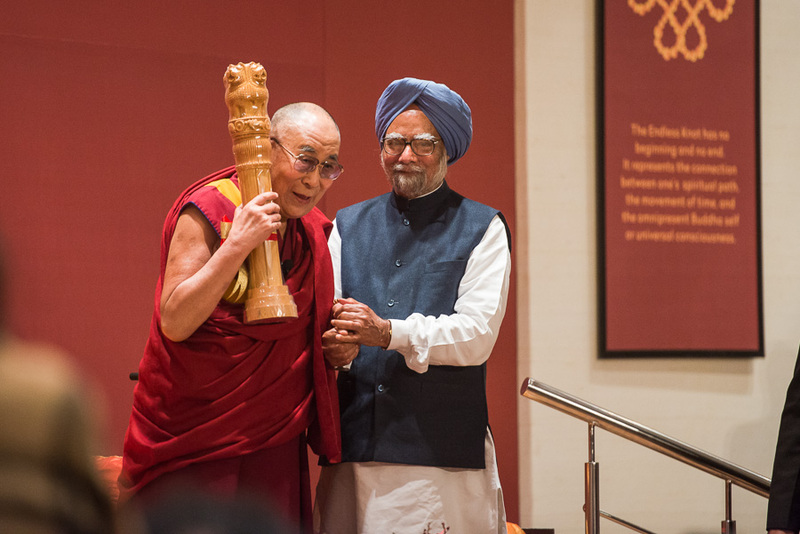 (TibetanReview.net, Jan06’16) – Tibet’s exiled spiritual leader, the Dalai Lama, was on Jan 4 felicitated at a special function in New Delhi on his 80th birth year, with India’s former Prime Minister Dr Manmohan Singh hailing him as “modern incarnation of Lord Buddha”. The congress leader also called him a “great gift of God to humanity”, reported India’s PTI news agency Jan 4. Dr Singh sought the Dalai Lama’s blessings for India to move forward on a path of peace, harmony, patience and forbearance during the event which was attended by prominent figures from diverse professions and walks of life. He also called the Dalai Lama a representative of ancient civilization and a “modern incarnation of Lord Buddha” and said the people of India were grateful to him for choosing the country after leaving Tibet. Others who attended addressed the special event and spoke on the Dalai Lama included India’s former Deputy Prime Minister Mr LK Advani, prominent Indian lawyer Ram Jethmalani, 2015 Nobel Peace laureate Mr Dr Kailash Satyarthi, well known actress Sharmila Taqore, Dr Kapila Vatsyayan, historian Ramachandra Guha, scholar and senior Indian politician Dr Karan Singh, National Convener of the Core Group for the Tibetan Cause RK Kirmey, jurist Fali Nariman, scholar and Lt Governor of Delhi Najeeb Jung, and social activist Aruna Roy.